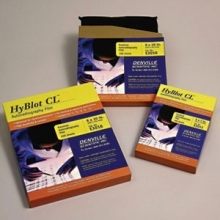 Denville HyBlot CL film provides sharp, clear results without the foggy background or grainy images normally associated with non-blue films. High sensitivity, suitable for weak signals / low radioactivity levels. Interleafed.